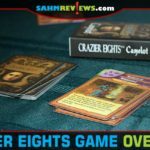 We have a lot of fun playing and talking about games on SahmReviews. 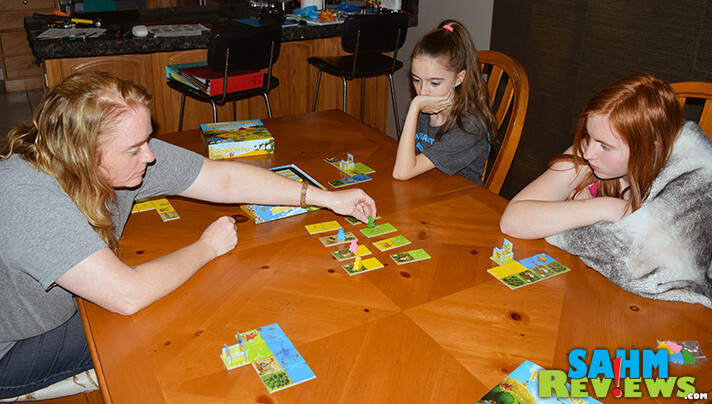 The fact that our daughters both enjoy playing offline games, and regularly win, makes it a family affair. Over the years we’ve covered 100’s of games from different publishers, both in our regular features and our weekly Thrift Treasure series. To the vast majority of our readers, every game we talk about is new to them. It doesn’t matter whether it is a brand new Kickstarter project or an 80’s abstract game, we try to pick ones that aren’t normally seen at your local big box store. Today’s game is the same thing with limited hobby distribution, but with last week’s major announcement that it was selected as a finalist for the coveted Spiel des Jahres (Game of the Year), you’ll probably see this one on the shelves of many local stores. 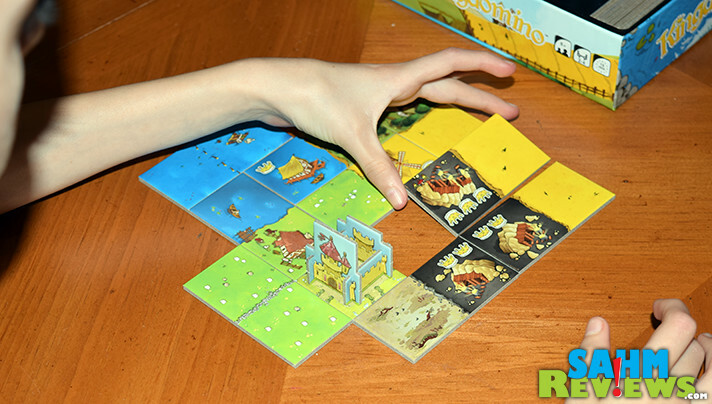 Kingdomino by Blue Orange Games is a family-style tile-laying game for up to four players. Side note – I do not know how to pronounce it. I’m not sure if it is “King-domino” or “Kingdom-ino”! I’m assuming the former since there are some domino-like aspects to the game, but the latter rolls off my tongue easier! 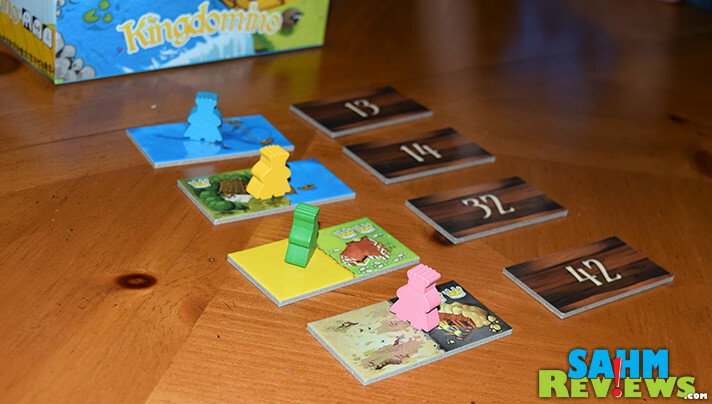 In Kingdomino, players are working to explore the lands surrounding their castle. 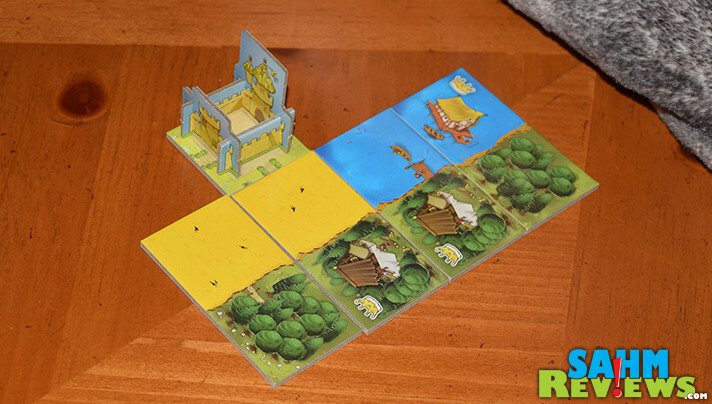 Each player takes a 3-D castle and starting tile and places both in front of them. Then tiles are randomly dealt from the pool equal to the number of players. Beginning with the starting player (also determined randomly), the Lords take turns clockwise choosing one of the tiles and placing their king on it. Before collecting the chosen tiles, a second line of tiles are dealt and laid next to the first. The order in which the kings were placed previously, from top to bottom, determines the player order for the next round. The first player removes their chosen tile, places it in their kingdom and then chooses the next tile they wish, keeping in mind that this new position will be their turn order for the next round. In order to add the chosen tile to their territory, they must follow some connection rules. All players are constructing a 5×5 grid and must never exceed this limitation. 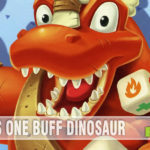 The new tile must either connect to the starting tile, which is considered wild, or a like-colored tile. If you cannot make a match or fit it into the grid, the tile is discarded and you receive no points for it. 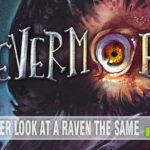 The game is played in twelve rounds (six in a 2-player game, as each player plays twice per turn) and you can expect a full game to only last around 15 minutes! Once all rounds are completed, your score is tallied by how well you matched up your tiles when laying them. For each connected area of one type of tile, multiply the number of squares by the number of crowns on any tiles in that section. You may have more than one section of a type, but they are scored separately. Obviously a good strategy is keeping as many crowns together as possible, maybe concentrating on only a couple of the landscape types. 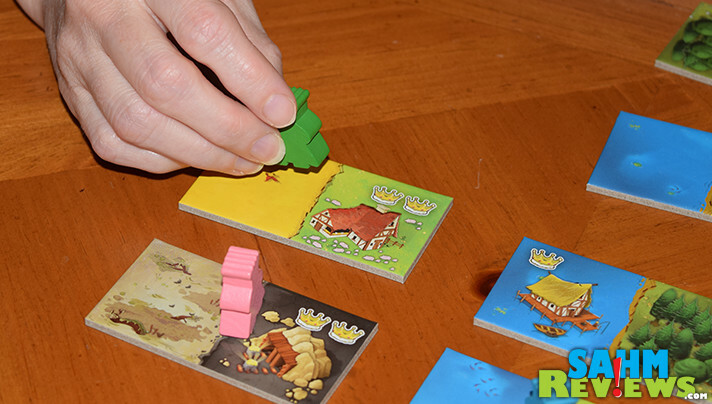 Once the basic game is masters, some additional rules may be applied, awarding bonus points for keeping your castle in the center of the kingdom or completing the territory with no discarded tiles. 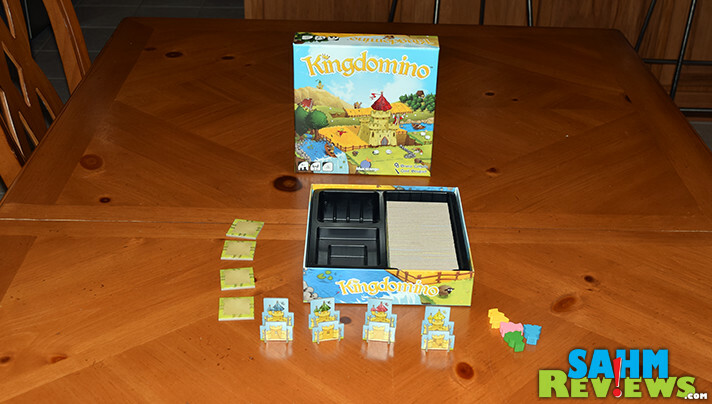 Kingdomino is very easy to learn and teach, and you’ll be up and running in a matter of minutes. Right now copies are still available on Amazon for the MSRP of $19.99, but with the award nomination and the potential for a category win, availability may soon become an issue. If you miss out right now, rest assured there will be more in stock in time for the holiday season! 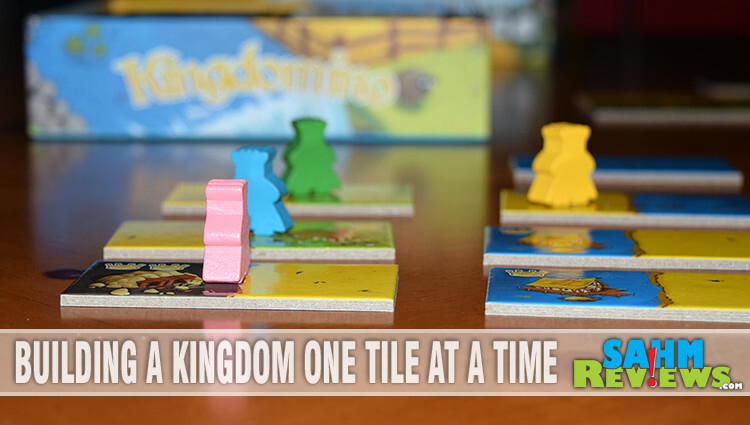 Keep track of Kingdomino’s availability by following Blue Orange Games’ Facebook and Twitter feeds, and be sure to check out what other family-friendly titles they currently have in stock on their website! Have you played any other games that were nominated for a Spiel des Jahres award? That is quite to tongue teaser! 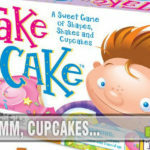 I would love to pick up a game like this for a holiday present, starting to stock up now! Hmmm, I think I’d go with the King domino pronounciation. I haven’t heard of the game before, I love dominoes but this sounds a bit different. I have not heard of this one but I do love Blue Orange Games and have played some of their other games. I’ve not heard of the award you mentioned but maybe I’ll look it up to see what other games have won. I need some new games for this summer to keep kids busy. Always loved all Blue Orange games and will have to check this one out. I’m always looking for new games to play. My daughter is completely into fantasy play, so this would be perfect for her!